Elegant and professional, we offer horse drawn carriages for any event, from weddings to anniversaries to proposals and parties. We custom decorate for each event and offer a footman and driver who are both in tuxedo attire. 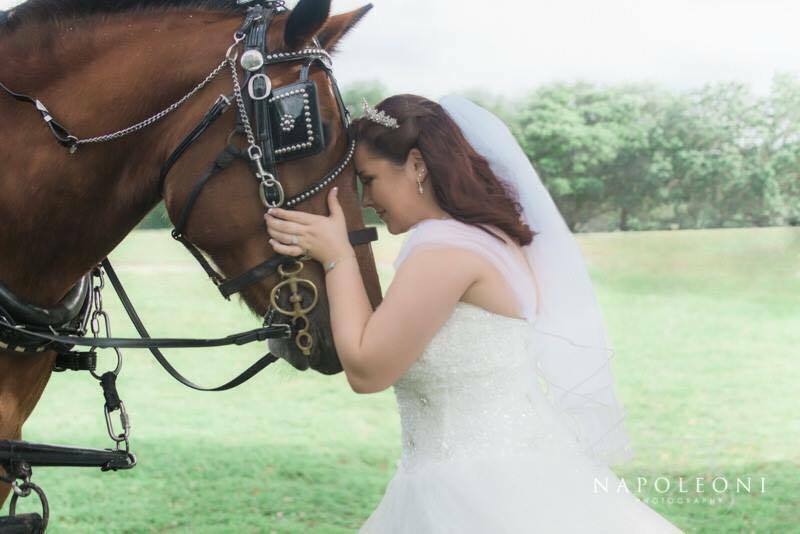 We can provide a "Just Married" sign for the back of the carriage and our professional staff is trained to coordinate your carriage with your photographer. We have worked in almost every type of venue, from Busch Gardens to the Vinoy Hotel to the neighborhood party! Also offering wagons for a more "rustic" touch, unicorn photo shoots for engagements, anniversaries, and children's parties with unicorn rides. Wonderful to do business with! We worked with Avalon West Carriage Service at a Daddy Daughter Dance in Lakeland and they were nothing short of Professional! The Carriage was clean and beautifully decorated and the team of horses were not only well groomed but amazingly well behaved! We would jump at the chance to work with this company again! If you are so lucky that they Service your area they come highly recommended! 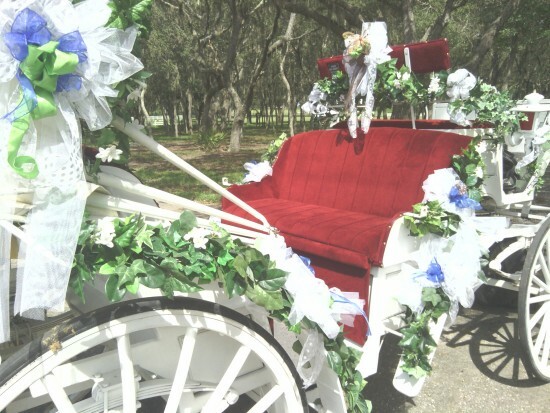 We offer custom decorated horse drawn carriages for any event. An audience member or wedding guest can expect to be "wowed" by the bride's entrance to the ceremony. We love our business. We are family owned and operated and have served the west central Florida area for almost 12 years. 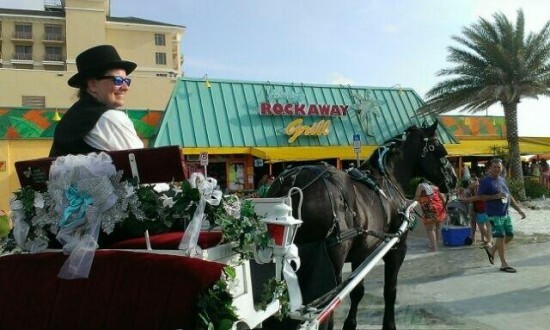 We're available for all types of events including proms, weddings, anniversaries, parties, proposals, arrivals with Santa Claus, Halloween carriage rides, and much much more. 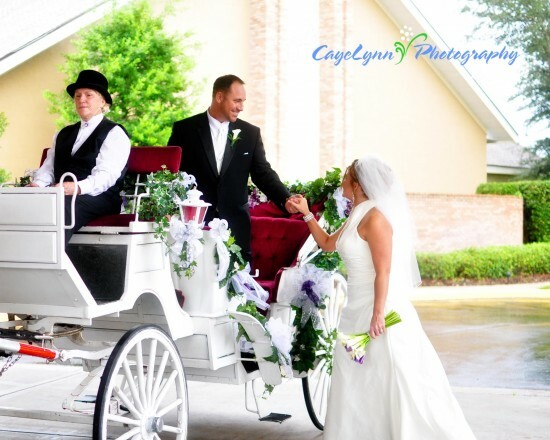 Our carriages our custom decorated and each comes with a footman and driver in tuxedo. The driver even wears a top hat. The footman can roll out a red carpet for your entrance or exit from the carriage and we have cute "Just Married" signs for the back of the carriage. We are able to travel most of the state of Florida and are fully insured. We require a contract to book and hold a carriage for a specific date. We do not allow food or beverages on the carriages. We do offer service for parades and parties depending on the occasion. We do not allow fireworks or sparklers at our carriage events. We have worked in the carriage industry in Florida since 1991 and our experience includes tours in the nation's oldest city - St. Augustine. 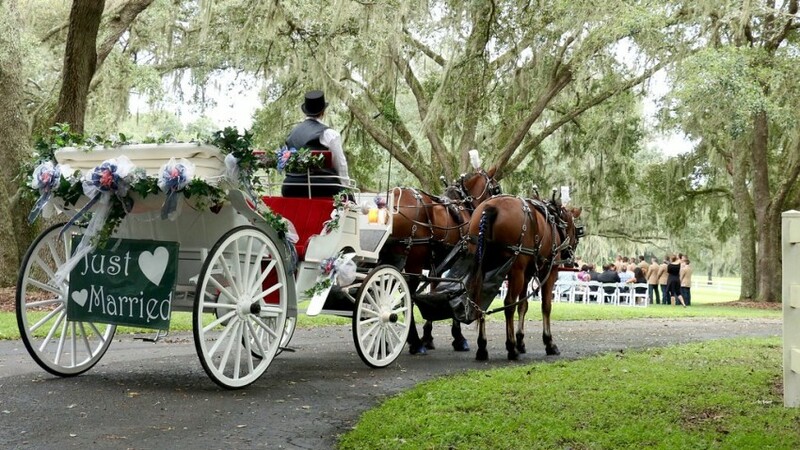 We have worked closely with Busch Gardens for events like weddings and parties, and our carriages have performed in the Mardi Gras celebration at Universal Studios along with the elegant Christmas carriage events at Old Hyde Park Village in Tampa. We require enough space to park a large rig plus space to maneuver the carriage and horse.